The economy is booming and there are a lot of people looking for great new jobs as more jobs open up. 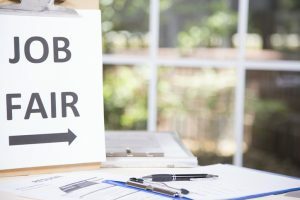 In the Covington area, and surrounding areas, there are a lot of opportunities but one of the easiest ways to find some open roles is through the Regional Job Fair that comes to the area every year. There are a lot of different employers that are present at this event making it a great time for people to make connections with prospective employers. Along with several other employers, SteelCo Buildings was a participant in the 2016 Regional Job Fair. There were hundreds of people who attended the job fair and made some great connections with SteelCo and other employers in the area. The fair took place at the Georgia Piedmont Technical College Main Campus and was a great place for people who were looking for a fresh start for their career or even looking to take their career to the next level. Not only were there a lot of people in attendance but also several employers looking for the right candidates to bring on board and to help grow their company. It may sometimes feel like it is hard to find a good job that pays well in the area but if you attended this fair or any of the other regional fairs, you would see that there are a lot of great companies, like SteelCo, hiring in the area. We spoke to a lot of people during that job fair and found some great candidates for our open roles that are still with us today. We have helped people find quality jobs with our company simply by taking the time to talk to them at the job fair. SteelCo Buildings is a growing company located in Oxford, GA. We have been participants of this Regional Job Fair for the past two years and are always looking for some great people to add to our team. We have roles available in the office as well as in sales and more. If you are looking for a new role for your career or want to get started with a great company, be sure to reach out to us to learn more about what we have available as well as more about our company and how we can help each other reach our goals.